"This is a true moonshot, and I hope this revitalizes moonshots around the world." In Yahud, Israel, a group of about 30 people are gathered to watch as a spacecraft called Beresheet attempts to become the first of a new kind of robot to touch down on the moon. 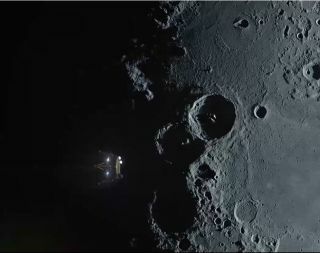 The Beresheet mission was inspired by the Google Lunar X Prize, a now-defunct competition to encourage private companies to develop lunar landers. Built by a nonprofit organization and a government-run aerospace company, Beresheet will attempt to land gently on the moon today (April 11) at 3:25 p.m. EDT (1925 GMT). "All laws of physics willing, it'll be safe on the surface in under two hours," Peter Diamandis, founder of XPRIZE, told Space.com from his outpost at mission control. "There's a huge level of energy and enthusiasm." Among the dignitaries invited to mission control were Israeli Prime Minister Benjamin Netanyahu and Anousheh Ansari, who sponsored the original X Prize for private spaceflight and who has flown in space herself. Although the prize that inspired the Beresheet mission was left unclaimed, he said that the mission, whether it succeeds or fails in the landing maneuver itself, represents the spirit of the prize. "I would say no matter what happens this has 100% fulfilled the purpose for which the original Google Lunar X Prize was created," Diamandis said. "There is a buzz and a level of excitement in the country and I think around the world that a small team, a private entity is landing on the lunar surface. It's a demonstration of what is now possible compared to 50 years ago." For Diamandis, the makeup of the Beresheet team is a clear signal of how spaceflight is changing. He said that about half of the staff in mission control are early career professionals in their 20s, rounded out by more experienced team members from Israel Aerospace Industries, the government-owned partner behind Beresheet. "It's a beautiful mix of youthfulness and experience," Diamandis. And he said that although the team first entered the competition naively, the engineers and scientists were able to make the mission come to life, despite the challenges that arose. "The major takeaway is what's possible given passion and persistence," Diamandis said. "This team never faltered and never gave up." All told, Diamandis said that he hopes the Beresheet mission makes a new kind of spaceflight a reality. "There's a FedEx of space, I should say a FedEx of the moon that's going to come out of this," he said. But there's more to the mission than pragmatism, he added. "It's a realization: Never ever, ever give up on your dreams," Diamandis said. "This is a true moonshot, and I hope this revitalizes moonshots around the world."